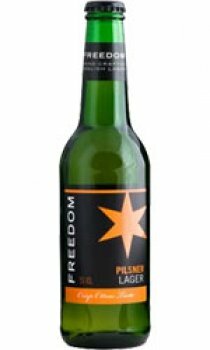 Freedom is a rare hand-crafted British lager that shows its big and bland rivals where they should be heading. With both style and substance, Freedom strikes a lip-smaking balance of grassy, flowery hops and sweet yet burly barley undertones to wondrous effect. "Crisp, refreshing and with a lavish aftertaste, Freedom is arguably the most thirst-slaking liquid to leave the environs of Burton for quite some time" - Ben McFarland, Britain's Beer Writer of the Year 2005.